We offer our clients a wide range of Sodium Carboxymethyl Cellulose. Sodium Carboxy Methyl Cellulose (CMC) is a granular powder that is odorless and its color varies from white to almost white. 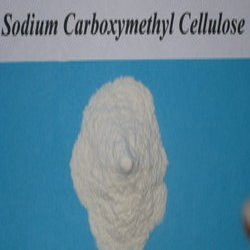 In its manufacture, cellulose acquired from wood pulp or cotton fibers is soaked in sodium hydroxide solution, due to which an alkali cellulose is formed. Being a client focused organization, we are instrumental in offering a commendable array of Sodium Carboxymethyl Cellulose. In its manufacture, cellulose acquired from wood pulp or cotton fibers is soaked in sodium hydroxide solution, due to which an alkali cellulose is formed.At our formulation unit, we ensure that the offered chemicals are formulated as per defined industry norms and offered at competitive prices.